An important skill for middle school students to adopt is that of reflective writing. 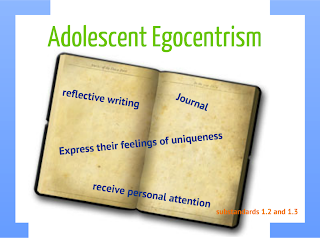 In order to appeal to adolescent egocentrism, a middle school Language arts teacher could begin class once a week with a journal reflection. They may ask students to respond to a different prompt each week that always focuses on a different aspect of their lives and how they feel. The goal in this activity would be to make the adolescent feel as if they are being given the chance to express their feelings of uniqueness as well as give them the opportunity to receive personal attention. This will appeal to adolescents experiencing egocentrism because they often feel as if no one is able to understand them. They are desperate for attention, willing to partake in dangerous and risky activities just to be noticed. By providing students with an opportunity to express how they feel, they will be able to communicate their sense of uniqueness while receiving the satisfaction of knowing that by reading their journal entries someone has listened to what they had to say. Students experiencing adolescent egocentrism believe the story of their life is unique and worth sharing.